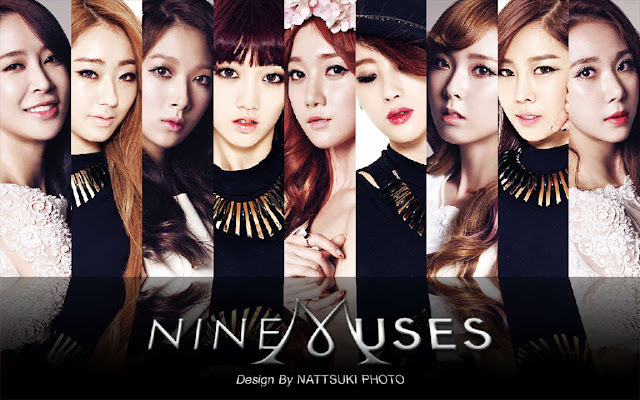 Nine Muses is a kpop girl group debuted last August 2010 but hasn't received too much attention. People say that maybe this is due to the fact that they have the same number of members like SNSD/ Girls Generation. They were almost always being compared and was even called copy cats because of the blocking, ending pose and costumes. This is the title track of Nine Muses' single album of the same name. It's a dance song with the sounds of brass instruments and guitar, and their improved vocals and rap stand out. It's about a woman, who tries to comfort herself by explaining why she feels the way she does after a breakup. The members of Nine Muses are not just pretty but also tall! This is no surprise because unlike other kpop groups, Nine Muses is formed by former models. I can say that Minha is my bias but I like other members too especially Hyuna and Kyungri. I am not sure who is the tallest member but they said that Sera is the shortest. I watched a few live performance, it is not as powerful as their practice video but I like it just the same. Nareul jogeumssik chajaga neol harussik jiwoga. Deo himdeulge naran yeojal ullige mandeulge haneunde yeah!! Idaero heulleoganeunge, neol ijeobeorineunge, nareul mot gyeondige hae. I would love to hear more of songs like Dolls, Nine Muses is a very promising kpop group. Do check them out! That's it for now, see you in my post!